Definition at line 349 of file llscrolllistctrl.h. Definition at line 622 of file llscrolllistctrl.h. Definition at line 500 of file llscrolllistctrl.cpp. References gEditMenuHandler, mItemList, and NULL. Definition at line 2687 of file llscrolllistctrl.cpp. References LLView::addChild(), LLSD::asString(), FALSE, LLRectBase< Type >::getWidth(), left, llround(), mColumnPadding, mColumns, mColumnsIndexed, mDefaultColumn, mDisplayColumnHeaders, LLScrollListColumn::mDynamicWidth, LLScrollListColumn::mHeader, mHeadingHeight, LLScrollListColumn::mIndex, mItemListRect, LLScrollListColumn::mLabel, LLRectBase< Type >::mLeft, mNumDynamicWidthColumns, LLScrollListColumn::mParentCtrl, LLScrollListColumn::mRelWidth, mScrollbar, LLRectBase< Type >::mTop, mTotalStaticColumnWidth, LLScrollListColumn::mWidth, LLView::removeChild(), right, S32, LLColumnHeader::setImage(), LLComboBox::setLabel(), LLUICtrl::setTabStop(), LLView::setVisible(), top, and updateColumns(). Referenced by LLComboBox::addColumn(), addElement(), and setColumnHeadings(). Definition at line 2857 of file llscrolllistctrl.cpp. References addColumn(), addItem(), LLSD::asBoolean(), LLSD::asString(), LLSD::asUUID(), LLSD::beginArray(), LLSD::endArray(), LLScrollListItem::getColumn(), LLResMgr::getRes(), LLFontGL::getStyleFromString(), LLImageProviderInterface::getUIImageByID(), gResMgr, LLSD::has(), LLFONT_SANSSERIF_SMALL, mColumns, mColumnsIndexed, mDefaultColumn, LLScrollListColumn::mFontAlignment, LLScrollListColumn::mHeader, LLScrollListColumn::mIndex, LLScrollListColumn::mWidth, LLFontGL::NORMAL, NULL, S32, LLScrollListText::setColor(), LLScrollListSeparator::setColor(), LLScrollListIcon::setColor(), LLScrollListItem::setColumn(), LLScrollListItem::setEnabled(), LLColumnHeader::setHasResizableElement(), LLScrollListItem::setNumColumns(), LLUI::sImageProvider, TRUE, type, and width. Referenced by LLNameListCtrl::addElement(), LLComboBox::addElement(), LLPanelFriends::addFriend(), LLPanelGroupVoting::impl::addNoActiveScrollListItem(), LLPanelGroupVoting::impl::addNoHistoryScrollListItem(), LLPanelGroupVoting::impl::addPendingActiveScrollListItem(), LLPanelGroupVoting::impl::addPendingHistoryScrollListItem(), LLPreviewGesture::addStep(), LLPanelGroupSubTab::buildActionCategory(), LLPanelMsgs::buildLists(), LLLiveLSLEditor::callbackLSLCompileFailed(), LLPreviewLSL::callbackLSLCompileFailed(), fromXML(), LLPanelGroupRolesSubTab::handleCreateRole(), LLPanelGroupMembersSubTab::handleMemberSelect(), LLPreviewGesture::loadUIFromGesture(), LLFloaterImport::postBuild(), LLPanelAvatar::processAvatarGroupsReply(), LLPanelGroupLandMoney::impl::processGroupLand(), LLPanelGroupNotices::processNotices(), LLFloaterInspect::refresh(), LLFloaterAvatarList::refreshAvatarList(), LLPanelActiveSpeakers::refreshSpeakers(), LLPanelAvatar::resetGroupList(), LLLiveLSLEditor::saveIfNeeded(), LLPreviewLSL::saveIfNeeded(), LLPanelGroupRolesSubTab::saveRoleChanges(), setValue(), LLPanelGroupRolesSubTab::update(), LLFloaterEventLog::updateList(), LLLiveLSLEditor::uploadAssetLegacy(), and LLPreviewLSL::uploadAssetLegacy(). Definition at line 693 of file llscrolllistctrl.cpp. References ADD_BOTTOM, ADD_SORTED, ADD_TOP, FALSE, LLRectBase< Type >::getHeight(), getItemCount(), LLView::getVisible(), llassert, mItemList, mItemListRect, mLineHeight, mMaxItemCount, mPageLines, mScrollbar, mSortAscending, mSortColumn, LLScrollbar::setDocSize(), LLScrollbar::setPageSize(), setSorted(), LLView::setVisible(), TRUE, updateColumns(), updateLineHeight(), and updateMaxContentWidth(). Referenced by addElement(), LLNameListCtrl::addGroupNameItem(), LLNameListCtrl::addNameItem(), addSimpleElement(), addSimpleItem(), and addStringUUIDItem(). Definition at line 2993 of file llscrolllistctrl.cpp. References LLScrollListItem::addColumn(), addItem(), LLView::getRect(), LLResMgr::getRes(), gResMgr, and LLFONT_SANSSERIF_SMALL. Referenced by LLComboBox::addSimpleElement(), LLFloaterAvatarPicker::find(), and LLFloaterAvatarPicker::postBuild(). Definition at line 1390 of file llscrolllistctrl.cpp. References LLScrollListItem::addColumn(), addItem(), getItemCount(), LLResMgr::getRes(), gResMgr, LLFONT_SANSSERIF_SMALL, mMaxItemCount, NULL, tut::sd(), and LLScrollListItem::setEnabled(). Definition at line 1218 of file llscrolllistctrl.cpp. References LLScrollListItem::addColumn(), addItem(), getItemCount(), LLResMgr::getRes(), gResMgr, LLFONT_SANSSERIF_SMALL, mMaxItemCount, NULL, and LLScrollListItem::setEnabled(). Referenced by LLComboBox::add(), LLLiveLSLEditor::callbackLSLCompileSucceeded(), LLPreviewLSL::callbackLSLCompileSucceeded(), fromXML(), LLNameListCtrl::fromXML(), LLPanelGroupActionsSubTab::handleActionSelect(), LLLiveLSLEditor::onSaveBytecodeComplete(), LLPanelGroupLandMoney::postBuild(), LLFloaterImport::postBuild(), LLPanelGroupNotices::processNotices(), LLPanelGroupMembersSubTab::update(), LLPanelGroupMembersSubTab::updateMembers(), and LLLiveLSLEditor::uploadAssetLegacy(). Definition at line 1378 of file llscrolllistctrl.cpp. References LLScrollListItem::addColumn(), addItem(), getItemCount(), LLResMgr::getRes(), gResMgr, LLFONT_SANSSERIF_SMALL, mMaxItemCount, and NULL. Referenced by LLNameListCtrl::addGroupNameItem(), LLNameListCtrl::addNameItem(), and LLFloaterMute::refreshMuteList(). Definition at line 673 of file llscrolllistctrl.cpp. References getItemCount(), LLRectBase< Type >::getWidth(), height, llmin(), mLineHeight, LLView::mRect, reshape(), S32, and width. Definition at line 2618 of file llscrolllistctrl.cpp. Definition at line 2631 of file llscrolllistctrl.cpp. Definition at line 2682 of file llscrolllistctrl.cpp. Definition at line 2643 of file llscrolllistctrl.cpp. Definition at line 2670 of file llscrolllistctrl.cpp. References getCanSelect(), mAllowMultipleSelection, mItemList, and mMaxSelectable. Definition at line 2810 of file llscrolllistctrl.cpp. Referenced by LLComboBox::addColumn(), and LLComboBox::clearColumns(). Definition at line 531 of file llscrolllistctrl.cpp. References FALSE, mDirty, mItemList, mLastSelected, mScrollbar, mScrollLines, NULL, LLScrollbar::setDocParams(), and updateMaxContentWidth(). Referenced by LLComboBox::clearRows(), deleteAllItems(), operateOnAll(), and LLPanelActiveSpeakers::refreshSpeakers(). Definition at line 507 of file llscrolllistctrl.h. Definition at line 2197 of file llscrolllistctrl.cpp. References FALSE, mDirty, mSelectionChanged, LLUICtrl::onCommit(), and TRUE. Referenced by deselectAllItems(), selectAll(), selectFirstItem(), selectItemAt(), selectMultiple(), selectNthItem(), selectPrevItem(), selectSimpleItem(), selectSimpleItemByPrefix(), and setSelectedByValue(). Definition at line 2604 of file llscrolllistctrl.cpp. References LLClipboard::copyFromSubstring(), gClipboard, getAllSelected(), and utf8str_to_wstring(). Definition at line 2624 of file llscrolllistctrl.cpp. Definition at line 370 of file llscrolllistctrl.h. Referenced by LLPanelGroupActionsSubTab::activate(), LLPanelGroupRolesSubTab::activate(), LLPanelMsgs::buildLists(), LLPanelGroupRolesSubTab::buildMembersList(), LLPanelGroupInvite::clear(), LLPanelEstateInfo::clearAccessLists(), LLFloaterNewIM::clearAllTargets(), LLPanelAvatarSecondLife::clearControls(), LLFloaterAvatarPicker::find(), LLPanelGroupActionsSubTab::handleActionSelect(), LLPanelGroupMembersSubTab::handleMemberSelect(), LLPanelGroupMembersSubTab::handleRoleCheck(), LLPanelGroupRolesSubTab::handleRoleSelect(), LLDispatchSetEstateAccess::operator()(), LLFloaterAvatarPicker::processAvatarPickerReply(), LLPanelLandBan::refresh(), LLPanelLandAccess::refresh(), LLPanelLandObjects::refresh(), LLFloaterAvatarList::refreshAvatarList(), LLFloaterMute::refreshMuteList(), LLPanelGroupLandMoney::impl::requestGroupLandInfo(), LLFloaterBuy::reset(), LLPanelAvatar::resetGroupList(), LLLiveLSLEditor::saveIfNeeded(), LLPreviewLSL::saveIfNeeded(), LLPanelGroupVoting::impl::sendGroupProposalsRequest(), LLPanelGroupVoting::impl::sendGroupVoteHistoryRequest(), LLPanelGroupActionsSubTab::update(), LLPanelGroupRolesSubTab::update(), LLPanelGroupMembersSubTab::update(), LLPanelGroupGeneral::update(), and LLFloaterEventLog::updateList(). Definition at line 1030 of file llscrolllistctrl.cpp. References mItemList, mLastSelected, NULL, and updateMaxContentWidth(). Referenced by LLPanelGroupMembersSubTab::handleEjectMembers(), LLPanelGroupInvite::impl::handleRemove(), operateOnSelection(), and LLComboBox::operateOnSelection(). Definition at line 1012 of file llscrolllistctrl.cpp. References mItemList, mLastSelected, NULL, S32, and updateMaxContentWidth(). Referenced by LLPanelGroupRolesSubTab::handleDeleteRole(), LLPanelAvatar::processAvatarGroupsReply(), LLComboBox::remove(), LLNameListCtrl::removeNameItem(), and LLPanelGroupRolesSubTab::saveRoleChanges(). Definition at line 2676 of file llscrolllistctrl.cpp. Definition at line 1199 of file llscrolllistctrl.cpp. References commitIfChanged(), deselectItem(), mCommitOnSelectionChange, and mItemList. Referenced by LLPanelGroupActionsSubTab::activate(), LLPanelGroupRolesSubTab::activate(), LLPreviewGesture::addStep(), LLComboBox::clear(), deselect(), LLFloaterAvatarPicker::doSelectionChange(), LLPanelGroupRolesSubTab::handleCreateRole(), LLPanelGroupRolesSubTab::handleRoleSelect(), operateOnAll(), operateOnSelection(), selectItem(), selectItemAt(), setSelectedByValue(), LLPanelGroupActionsSubTab::update(), and LLComboBox::updateSelection(). Definition at line 2176 of file llscrolllistctrl.cpp. References FALSE, LLScrollListItem::getColumn(), LLScrollListItem::getSelected(), LLScrollListCell::highlightText(), mLastSelected, mSearchColumn, mSelectionChanged, NULL, LLScrollListItem::setSelected(), and TRUE. Referenced by deselectAllItems(), selectFirstItem(), selectItemAt(), selectNthItem(), and setSelectedByValue(). Definition at line 2637 of file llscrolllistctrl.cpp. Definition at line 1616 of file llscrolllistctrl.cpp. References LLView::draw(), drawItems(), FALSE, LLView::getEnabled(), LLRectBase< Type >::getHeight(), LLFocusMgr::getKeyboardFocus(), LLView::getVisible(), LLRectBase< Type >::getWidth(), gFocusMgr, gl_rect_2d(), glColor4fv, mBackgroundVisible, mBgReadOnlyColor, mBgWriteableColor, mBorder, mNeedsScroll, LLView::mRect, LLColor4::mV, scrollToShowSelected(), and LLViewBorder::setKeyboardFocusHighlight(). Definition at line 1483 of file llscrolllistctrl.cpp. References clamp_rescale(), f, FALSE, LLFrameTimer::getElapsedTimeF32(), LLControlGroup::getF32(), LLView::getVisible(), LLRectBase< Type >::getWidth(), gl_rect_2d(), glColor4fv, LIST_BORDER_PAD, llmax(), mBgSelectedColor, mBgStripeColor, mCanSelect, mColumnPadding, mColumnsIndexed, mDrawStripes, mDrewSelected, mFgDisabledColor, mFgSelectedColor, mFgUnselectedColor, mHighlightedColor, mHighlightedItem, mItemList, mItemListRect, LLRectBase< Type >::mLeft, mLineHeight, mNumDynamicWidthColumns, mPageLines, LLRectBase< Type >::mRight, mScrollbar, mScrollLines, mSearchTimer, LLRectBase< Type >::mTop, mTotalStaticColumnWidth, LLColor4::mV, LLUI::popMatrix(), LLUI::pushMatrix(), S32, LLUI::sConfigGroup, LLRectBase< Type >::setOriginAndSize(), LLRectBase< Type >::stretch(), LLUI::translate(), TRUE, VALPHA, LLColor4::white, x, and y. Definition at line 2441 of file llscrolllistctrl.cpp. References addElement(), addSimpleItem(), LLView::createRect(), FALSE, LLUICtrl::initFromXML(), LLFontGL::LEFT, LLScrollListCtrl(), LLPointer< Type >::notNull(), NULL, S32, LLView::selectFontHAlign(), setCollapseEmptyColumns(), setColumnHeadings(), setDisplayHeading(), setHeadingHeight(), setNumDynamicColumns(), setScrollListParameters(), setSearchColumn(), setTotalStaticColumnWidth(), and TRUE. Definition at line 634 of file llscrolllistctrl.cpp. Referenced by LLPanelGroupInvite::impl::addUsers(), LLPreviewGesture::createGesture(), LLComboBox::getXML(), LLFloaterNewIM::isUUIDAvailable(), LLPanelGroupInvite::impl::submitInvitations(), and LLPreviewGesture::~LLPreviewGesture(). Definition at line 561 of file llscrolllistctrl.cpp. Referenced by copy(), LLFloaterAvatarPicker::doSelectionChange(), LLPanelFriends::getSelectedIDs(), LLFloaterInspect::getSelectedUUID(), LLPanelGroupActionsSubTab::handleActionSelect(), LLPanelGroupMembersSubTab::handleEjectMembers(), LLPanelGroupMembersSubTab::handleMemberSelect(), LLFloaterImport::handleMouseDown(), LLPanelGroupInvite::impl::handleRemove(), LLPanelGroupMembersSubTab::handleRoleCheck(), LLPanelGroupInvite::impl::handleSelection(), LLFloaterImport::onBtnOK(), LLFloaterInspect::onClickCreatorProfile(), LLPanelMsgs::onClickEnablePopup(), LLFloaterInspect::onClickOwnerProfile(), LLPanelFriends::refreshUI(), and selectItemAt(). Definition at line 443 of file llscrolllistctrl.h. Referenced by canDeselect(), and canSelectAll(). Definition at line 2838 of file llscrolllistctrl.cpp. References mColumnsIndexed, NULL, and S32. Referenced by LLNameListCtrl::addElement(), LLNameListCtrl::addNameItem(), LLColumnHeader::findSnapEdge(), LLColumnHeader::setHasResizableElement(), LLColumnHeader::showList(), and LLColumnHeader::userSetShape(). Definition at line 492 of file llscrolllistctrl.h. Definition at line 408 of file llscrolllistctrl.h. Definition at line 616 of file llscrolllistctrl.cpp. Definition at line 547 of file llscrolllistctrl.cpp. Referenced by LLPanelEstateInfo::accessRemoveCore(), LLPanelGroupRolesSubTab::buildMembersList(), canCopy(), LLPanelEstateInfo::checkRemovalButton(), LLPanelMsgs::draw(), LLComboBox::getCurrentIndex(), LLComboBox::getCurrentUserdata(), LLFloaterInspect::getSelectedUUID(), getSimpleSelectedItem(), getSimpleSelectedValue(), getStringUUIDSelectedItem(), getValue(), LLComboBox::getValue(), LLPanelGroupRolesSubTab::handleActionCheck(), LLPanelGroupRolesSubTab::handleDeleteRole(), handleKeyHere(), LLPanelGroupMembersSubTab::handleMemberDoubleClick(), LLPanelGroupRolesSubTab::handleMemberVisibilityChange(), LLPanelGroupRolesSubTab::handleRoleSelect(), LLFloaterInspect::onClickCreatorProfile(), LLFloaterInspect::onClickOwnerProfile(), LLFloaterAvatarList::onClickTeleport(), LLFloaterAvatarList::onClickTrack(), LLPanelAvatarSecondLife::onDoubleClickGroup(), LLPanelGroupLandMoney::impl::onMapButton(), LLDispatchSetEstateAccess::operator()(), LLPreviewGesture::refresh(), LLFloaterInspect::refresh(), LLPanelFriends::refreshUI(), LLComboBox::remove(), LLNameListCtrl::removeNameItem(), selectNextItem(), selectPrevItem(), LLPanelGroupVoting::impl::setEnableHistoryItem(), LLPanelGroupVoting::impl::setEnableVoteProposal(), setFocus(), LLComboBox::setValue(), LLComboBox::showList(), LLPanelGroupRolesSubTab::update(), LLFloaterMute::updateButtons(), LLFloaterEventLog::updateControlsState(), and LLFloaterEventLog::updateSelectedEventInfo(). Definition at line 599 of file llscrolllistctrl.cpp. Referenced by LLFloaterNewIM::addAgent(), LLFloaterNewIM::addGroup(), LLFloaterNewIM::addSpecial(), LLPanelGroupRolesSubTab::handleDeleteRole(), handleKeyHere(), handleUnicodeCharHere(), isDirty(), LLFloaterMute::onClickRemove(), LLPreviewGesture::refresh(), LLFloaterInspect::refresh(), resetDirty(), and scrollToShowSelected(). Definition at line 525 of file llscrolllistctrl.cpp. Referenced by addItem(), addSimpleItem(), addStringUUIDItem(), arrange(), LLComboBox::getItemCount(), getRequiredRect(), handleKeyHere(), LLFloaterMute::onClickRemove(), LLDispatchSetEstateAccess::operator()(), LLPreviewGesture::refresh(), reshape(), and setMaxItemCount(). Definition at line 1101 of file llscrolllistctrl.cpp. Definition at line 1085 of file llscrolllistctrl.cpp. Referenced by LLComboBox::getCurrentIndex(), handleHover(), LLComboBox::handleKeyHere(), LLComboBox::handleUnicodeCharHere(), LLPanelAvatar::processAvatarGroupsReply(), LLFloaterInspect::refresh(), LLComboBox::remove(), LLNameListCtrl::removeNameItem(), and LLPanelGroupRolesSubTab::saveRoleChanges(). Definition at line 531 of file llscrolllistctrl.h. Definition at line 625 of file llscrolllistctrl.cpp. Definition at line 471 of file llscrolllistctrl.h. Referenced by LLComboBox::handleKeyHere(), LLFloaterImport::handleMouseDown(), and LLComboBox::handleUnicodeCharHere(). Definition at line 403 of file llscrolllistctrl.h. Definition at line 498 of file llscrolllistctrl.h. Definition at line 386 of file llscrolllistctrl.h. Definition at line 684 of file llscrolllistctrl.cpp. References getItemCount(), LLRectBase< Type >::getWidth(), height, mLineHeight, LLView::mRect, S32, and width. Definition at line 404 of file llscrolllistctrl.h. Definition at line 2271 of file llscrolllistctrl.cpp. Referenced by LLFloaterNewIM::getScrollPos(), LLFloaterInspect::refresh(), LLFloaterAvatarList::refreshAvatarList(), LLPanelFriends::refreshNames(), reshape(), and LLFloaterEventLog::updateList(). Definition at line 504 of file llscrolllistctrl.h. Definition at line 581 of file llscrolllistctrl.cpp. Referenced by LLFloaterEventLog::doCommand(), LLFloaterAvatarList::getSelectedNames(), LLFloaterAvatarList::luskwoodCommand(), LLFloaterAvatarList::onClickAR(), LLFloaterAvatarList::onClickIM(), LLFloaterAvatarList::onClickMark(), LLFloaterAvatarList::refreshAvatarList(), and LLFloaterEventLog::updateList(). Definition at line 402 of file llscrolllistctrl.h. Definition at line 1361 of file llscrolllistctrl.cpp. References LLScrollListItem::getColumn(), getFirstSelected(), LLScrollListCell::getText(), and LLStringBase< char >::null. Referenced by LLComboBox::getSimple(), LLComboBox::getSimpleSelectedItem(), LLFloaterMute::onClickRemove(), LLComboBox::setCurrentByID(), LLComboBox::setCurrentByIndex(), LLComboBox::setSelectedByValue(), LLComboBox::setValue(), and LLComboBox::updateSelection(). Definition at line 1469 of file llscrolllistctrl.cpp. Referenced by LLComboBox::getSimpleSelectedValue(), and LLPanelActiveSpeakers::refreshSpeakers(). Definition at line 569 of file llscrolllistctrl.h. Referenced by LLColumnHeader::draw(), LLColumnHeader::onClick(), LLPanelActiveSpeakers::refreshSpeakers(), and LLColumnHeader::showList(). Definition at line 2802 of file llscrolllistctrl.cpp. References mColumnsIndexed, LLScrollListColumn::mName, mSortColumn, and NULL. Referenced by LLColumnHeader::draw(), and LLPanelActiveSpeakers::refreshSpeakers(). Definition at line 1457 of file llscrolllistctrl.cpp. References getFirstSelected(), LLScrollListItem::getUUID(), and LLUUID::null. Referenced by getCurrentID(), LLComboBox::getCurrentID(), and LLFloaterMute::onClickRemove(). Definition at line 3021 of file llscrolllistctrl.cpp. Referenced by LLPanelActiveSpeakers::onClickMuteTextCommit(), LLPanelActiveSpeakers::onClickMuteVoiceCommit(), LLPanelActiveSpeakers::onClickProfile(), and LLPanelActiveSpeakers::onVolumeChange(). Definition at line 363 of file llscrolllistctrl.h. Definition at line 362 of file llscrolllistctrl.h. Definition at line 2322 of file llscrolllistctrl.cpp. References LLView::addColorXML(), FALSE, LLUICtrl::getXML(), mAllowMultipleSelection, mBackgroundVisible, mBgReadOnlyColor, mBgSelectedColor, mBgStripeColor, mBgWriteableColor, mBorder, mColumnPadding, mColumns, mDisplayColumnHeaders, mDrawStripes, mFgDisabledColor, mFgSelectedColor, mFgUnselectedColor, mHighlightedColor, LLScrollListColumn::mLabel, LLScrollListColumn::mName, LLScrollListColumn::mWidth, NULL, and TRUE. Definition at line 1808 of file llscrolllistctrl.cpp. References LLView::childrenHandleDoubleClick(), LLView::getVisible(), LLUICtrl::mCallbackUserData, mCanSelect, mOnDoubleClickCallback, NULL, and TRUE. Definition at line 1863 of file llscrolllistctrl.cpp. References FALSE, getItemIndex(), LLView::handleHover(), LLView::hasMouseCapture(), highlightNthItem(), hitItem(), MASK_NONE, mCanSelect, mNeedsScroll, selectItemAt(), and TRUE. Definition at line 1901 of file llscrolllistctrl.cpp. References FALSE, LLScrollListItem::getColumn(), getFirstSelected(), getFirstSelectedIndex(), getItemCount(), LLScrollbar::getPageSize(), LLView::getVisible(), LLUICtrl::hasFocus(), LLScrollListCell::highlightText(), KEY_BACKSPACE, KEY_DOWN, KEY_END, KEY_HOME, KEY_PAGE_DOWN, KEY_PAGE_UP, KEY_RETURN, KEY_UP, mAllowKeyboardMovement, MASK_NONE, mCanSelect, mCommitOnKeyboardMovement, mCommitOnSelectionChange, mNeedsScroll, mScrollbar, mSearchColumn, mSearchString, mSearchTimer, LLUICtrl::onCommit(), LLFrameTimer::reset(), selectFirstItem(), selectNextItem(), selectNthItem(), selectPrevItem(), selectSimpleItemByPrefix(), TRUE, and wstring_to_utf8str(). Definition at line 1763 of file llscrolllistctrl.cpp. References LLView::childrenHandleMouseDown(), FALSE, gFocusMgr, mNeedsScroll, mSelectionChanged, NULL, selectItemAt(), setFocus(), LLFocusMgr::setMouseCapture(), and TRUE. Definition at line 1783 of file llscrolllistctrl.cpp. References FALSE, gFocusMgr, LLView::handleMouseUp(), LLView::hasMouseCapture(), MASK_NONE, mDirty, mItemListRect, mNeedsScroll, mSelectionChanged, NULL, LLUICtrl::onCommit(), LLRectBase< Type >::pointInRect(), selectItemAt(), LLFocusMgr::setMouseCapture(), and TRUE. Definition at line 1652 of file llscrolllistctrl.cpp. References FALSE, LLScrollbar::handleScrollWheel(), and mScrollbar. Definition at line 2036 of file llscrolllistctrl.cpp. References FALSE, LLScrollListItem::getColumn(), LLFrameTimer::getElapsedTimeF32(), LLScrollListItem::getEnabled(), LLControlGroup::getF32(), getFirstSelectedIndex(), LLScrollListCell::getText(), LLScrollListCell::highlightText(), isRepeatedChars(), mCommitOnKeyboardMovement, mCommitOnSelectionChange, mItemList, mNeedsScroll, mSearchColumn, mSearchString, mSearchTimer, LLUICtrl::onCommit(), LLFrameTimer::reset(), S32, LLUI::sConfigGroup, selectItem(), selectSimpleItemByPrefix(), LLStringOps::toLower(), TRUE, utf8str_to_wstring(), and wstring_to_utf8str(). Definition at line 1050 of file llscrolllistctrl.cpp. Referenced by handleHover(), LLComboBox::handleKeyHere(), LLComboBox::handleUnicodeCharHere(), and LLComboBox::hideList(). Definition at line 1826 of file llscrolllistctrl.cpp. References LLRectBase< Type >::getWidth(), mItemList, mItemListRect, LLRectBase< Type >::mLeft, mLineHeight, mPageLines, mScrollLines, LLRectBase< Type >::mTop, NULL, LLRectBase< Type >::pointInRect(), S32, LLRectBase< Type >::setLeftTopAndSize(), and LLRectBase< Type >::translate(). Referenced by handleHover(), and selectItemAt(). Definition at line 3074 of file llscrolllistctrl.cpp. References getFirstSelectedIndex(), mAllowMultipleSelection, mDirty, and mOriginalSelection. Definition at line 520 of file llscrolllistctrl.cpp. Definition at line 2132 of file llscrolllistctrl.cpp. References FALSE, i, and TRUE. Definition at line 1443 of file llscrolllistctrl.cpp. References LLSD::asString(), FALSE, and mItemList. Definition at line 2212 of file llscrolllistctrl.cpp. Definition at line 2768 of file llscrolllistctrl.cpp. References LLUICtrl::getCallbackUserData(), mColumns, mColumnsIndexed, LLScrollListColumn::mIndex, LLScrollListColumn::mName, mOnSortChangedCallback, LLScrollListColumn::mParentCtrl, mSortAscending, LLScrollListColumn::mSortAscending, mSortColumn, LLScrollListColumn::mSortingColumn, and sortByColumn(). Definition at line 3100 of file llscrolllistctrl.cpp. References LLView::getParent(), gFocusMgr, LLView::hasMouseCapture(), mIsPopup, NULL, LLUICtrl::onFocusLost(), LLView::onFocusLost(), and LLFocusMgr::setMouseCapture(). Definition at line 3093 of file llscrolllistctrl.cpp. Definition at line 2219 of file llscrolllistctrl.cpp. Definition at line 3042 of file llscrolllistctrl.cpp. References clearRows(), deselectAllItems(), FALSE, LLCtrlSelectionInterface::OP_DELETE, LLCtrlSelectionInterface::OP_DESELECT, LLCtrlSelectionInterface::OP_SELECT, selectAll(), and TRUE. Referenced by LLFloaterInspect::refresh(), and LLPanelFriends::refreshNames(). Definition at line 3028 of file llscrolllistctrl.cpp. References deleteSelectedItems(), deselectAllItems(), FALSE, LLCtrlSelectionInterface::OP_DELETE, LLCtrlSelectionInterface::OP_DESELECT, and TRUE. Definition at line 2127 of file llscrolllistctrl.cpp. Referenced by selectNextItem(), and selectPrevItem(). Definition at line 3085 of file llscrolllistctrl.cpp. References FALSE, getFirstSelectedIndex(), mDirty, and mOriginalSelection. Definition at line 647 of file llscrolllistctrl.cpp. References LLScrollbar::getDocPosMax(), LLRectBase< Type >::getHeight(), getItemCount(), getScrollPos(), LLRectBase< Type >::getWidth(), LIST_BORDER_PAD, mBorderThickness, mDisplayColumnHeaders, mHeadingHeight, mItemListRect, mLineHeight, mPageLines, LLView::mRect, mScrollbar, LLView::reshape(), S32, LLRectBase< Type >::setOriginAndSize(), LLScrollbar::setPageSize(), setScrollPos(), LLView::setVisible(), and updateColumns(). Referenced by arrange(), LLColumnHeader::LLColumnHeader(), setHeadingHeight(), LLColumnHeader::showList(), and LLComboBox::showList(). Definition at line 2285 of file llscrolllistctrl.cpp. References getFirstSelectedIndex(), LLView::hasMouseCapture(), mItemList, mPageLines, mScrollLines, S32, and setScrollPos(). Definition at line 2650 of file llscrolllistctrl.cpp. References commitIfChanged(), FALSE, mCommitOnSelectionChange, mItemList, and selectItem(). Definition at line 1405 of file llscrolllistctrl.cpp. Referenced by LLPanelGroupRolesSubTab::handleCreateRole(), LLNameListCtrl::removeNameItem(), LLFloaterMute::selectMute(), setCurrentByID(), and LLComboBox::setCurrentByID(). Definition at line 913 of file llscrolllistctrl.cpp. References commitIfChanged(), deselectItem(), FALSE, mCommitOnSelectionChange, mItemList, mOriginalSelection, selectItem(), and TRUE. Referenced by LLComboBox::add(), LLFloaterNewIM::addAgent(), LLFloaterNewIM::addGroup(), LLFloaterNewIM::addSpecial(), LLPanelGroupRolesSubTab::handleDeleteRole(), handleKeyHere(), LLPreviewGesture::initDefaultGesture(), LLPanelActiveSpeakers::refreshSpeakers(), LLScriptEdCore::selectFirstError(), selectNextItem(), selectPrevItem(), setFocus(), and LLComboBox::showList(). Definition at line 2152 of file llscrolllistctrl.cpp. References deselectAllItems(), LLScrollListItem::getSelected(), LLScrollListCell::highlightText(), mLastSelected, mSearchColumn, mSelectionChanged, LLScrollListItem::setSelected(), and TRUE. Referenced by handleUnicodeCharHere(), selectAll(), selectFirstItem(), selectItemAt(), selectMultiple(), selectNextItem(), selectNthItem(), selectPrevItem(), selectSimpleItem(), selectSimpleItemByPrefix(), and setSelectedByValue(). Definition at line 1660 of file llscrolllistctrl.cpp. References commitIfChanged(), deselectAllItems(), deselectItem(), FALSE, getAllSelected(), LLScrollListItem::getSelected(), LLScrollListItem::handleClick(), hitItem(), LIST_BORDER_PAD, mAllowMultipleSelection, MASK_CONTROL, MASK_SHIFT, mBorderThickness, LLUICtrl::mCallbackUserData, mCanSelect, mCommitOnSelectionChange, mItemList, mLastSelected, mMaxSelectable, mOnMaximumSelectCallback, mSearchString, mSelectionChanged, NULL, selectItem(), size, and TRUE. 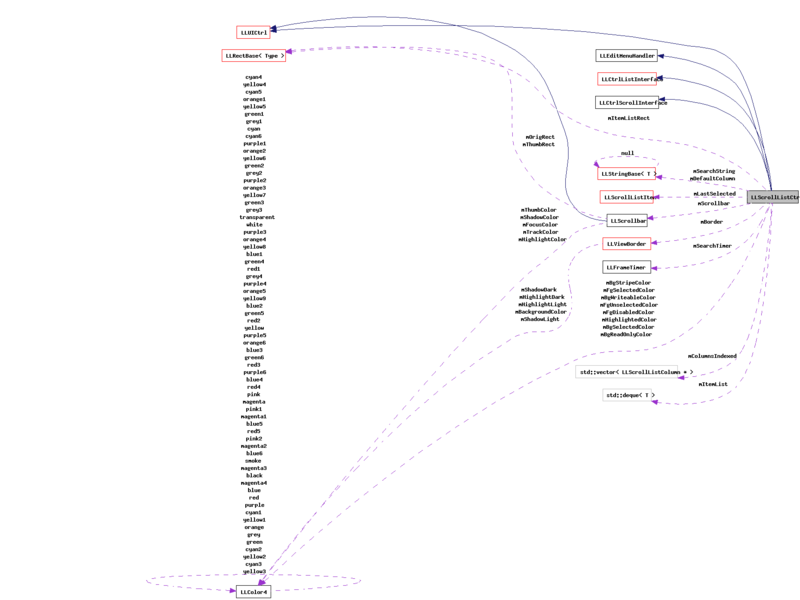 Referenced by handleHover(), handleMouseDown(), and handleMouseUp(). Definition at line 1058 of file llscrolllistctrl.cpp. References commitIfChanged(), count, FALSE, mCommitOnSelectionChange, mItemList, S32, and selectItem(). Referenced by LLFloaterAvatarList::refreshAvatarList(), LLPanelFriends::refreshNames(), and LLFloaterEventLog::updateList(). Definition at line 1158 of file llscrolllistctrl.cpp. References getFirstSelected(), mCommitOnKeyboardMovement, mItemList, mSearchString, LLUICtrl::onCommit(), reportInvalidInput(), selectFirstItem(), and selectItem(). Definition at line 947 of file llscrolllistctrl.cpp. References commitIfChanged(), deselectItem(), FALSE, llclamp(), mCommitOnSelectionChange, mItemList, mOriginalSelection, mSearchString, S32, selectItem(), and TRUE. Referenced by handleKeyHere(), LLColumnHeader::onClick(), LLFloaterMute::onClickRemove(), LLFloaterInspect::refresh(), and LLComboBox::setCurrentByIndex(). Definition at line 1117 of file llscrolllistctrl.cpp. References commitIfChanged(), getFirstSelected(), mCommitOnKeyboardMovement, mCommitOnSelectionChange, mItemList, mSearchString, NULL, reportInvalidInput(), selectFirstItem(), and selectItem(). Definition at line 1235 of file llscrolllistctrl.cpp. References commitIfChanged(), FALSE, mCommitOnSelectionChange, mItemList, S32, selectItem(), and LLStringBase< char >::toLower(). Referenced by LLComboBox::remove(), LLComboBox::setLabel(), LLComboBox::setSimple(), and LLComboBox::updateSelection(). Definition at line 1287 of file llscrolllistctrl.cpp. References commitIfChanged(), FALSE, LLScrollListCell::getText(), LLScrollListCell::highlightText(), mCommitOnSelectionChange, mItemList, mSearchColumn, S32, selectItem(), target, LLStringBase< T >::toLower(), LLStringBase< T >::trim(), TRUE, and utf8str_to_wstring(). Definition at line 1280 of file llscrolllistctrl.cpp. Referenced by handleKeyHere(), handleUnicodeCharHere(), and LLComboBox::updateSelection(). Definition at line 495 of file llscrolllistctrl.h. Definition at line 478 of file llscrolllistctrl.h. Referenced by LLFloaterImport::postBuild(), and LLFloaterAvatarPicker::setAllowMultiple(). Definition at line 489 of file llscrolllistctrl.h. Definition at line 482 of file llscrolllistctrl.h. Referenced by LLPanelGroupVoting::impl::setEnableListProposals(), and setScrollListParameters(). Definition at line 483 of file llscrolllistctrl.h. Definition at line 480 of file llscrolllistctrl.h. Referenced by LLComboBox::LLComboBox(), and setScrollListParameters(). Definition at line 442 of file llscrolllistctrl.h. Referenced by LLFloaterImport::postBuild(), LLPanelGroupVoting::impl::sendGroupProposalsRequest(), and LLPanelGroupVoting::impl::sendGroupVoteHistoryRequest(). Definition at line 908 of file llscrolllistctrl.cpp. Referenced by fromXML(), and LLNameListCtrl::fromXML(). Definition at line 2847 of file llscrolllistctrl.cpp. References addColumn(), LLSD::beginArray(), LLSD::endArray(), and mColumns. Definition at line 2825 of file llscrolllistctrl.cpp. Definition at line 491 of file llscrolllistctrl.h. Definition at line 493 of file llscrolllistctrl.h. Definition at line 494 of file llscrolllistctrl.h. Referenced by LLFloaterMute::LLFloaterMute(), LLPanelGroupNotices::postBuild(), LLPanelGroupInvite::postBuild(), LLFloaterTopObjects::postBuild(), LLPanelEstateInfo::postBuild(), LLPanelFriends::postBuild(), LLPanelGroupActionsSubTab::postBuildSubTab(), LLPanelGroupRolesSubTab::postBuildSubTab(), and LLPanelGroupMembersSubTab::postBuildSubTab(). Definition at line 407 of file llscrolllistctrl.h. Definition at line 889 of file llscrolllistctrl.cpp. References mDisplayColumnHeaders, mHeadingHeight, setHeadingHeight(), and updateColumns(). Definition at line 435 of file llscrolllistctrl.h. Referenced by LLFloaterAvatarList::LLFloaterAvatarList(), LLFloaterEventLog::LLFloaterEventLog(), LLPanelGroupVoting::postBuild(), LLPanelGroupGeneral::postBuild(), LLFloaterNewIM::postBuild(), LLPanelLandObjects::postBuild(), and LLPanelGroupMembersSubTab::postBuildSubTab(). Definition at line 490 of file llscrolllistctrl.h. Definition at line 1645 of file llscrolllistctrl.cpp. References LLScrollbar::getDocSize(), LLScrollbar::getPageSize(), mCanSelect, mScrollbar, and LLUICtrl::setTabStop(). Referenced by LLPanelGroupMembersSubTab::handleMemberSelect(), LLPanelGroupRolesSubTab::handleRoleSelect(), LLPanelGroupLandMoney::postBuild(), LLPanelGroupNotices::processNotices(), LLPreviewGesture::refresh(), LLPanelLandObjects::refresh(), LLPanelGroupVoting::impl::setEnableHistoryList(), LLPanelGroupMembersSubTab::update(), LLPanelGroupGeneral::update(), LLPanelGroupMembersSubTab::updateMembers(), and LLPanelGroupGeneral::updateMembers(). Definition at line 487 of file llscrolllistctrl.h. Definition at line 484 of file llscrolllistctrl.h. Definition at line 485 of file llscrolllistctrl.h. Definition at line 3060 of file llscrolllistctrl.cpp. References getFirstSelected(), mSearchString, selectFirstItem(), and LLUICtrl::setFocus(). Referenced by handleMouseDown(), and LLComboBox::showList(). Definition at line 898 of file llscrolllistctrl.cpp. References LLRectBase< Type >::getHeight(), LLRectBase< Type >::getWidth(), mDisplayColumnHeaders, mHeadingHeight, mItemListRect, LLView::mRect, mScrollbar, LLScrollbar::reshape(), and reshape(). Referenced by fromXML(), LLNameListCtrl::fromXML(), and setDisplayHeading(). Definition at line 486 of file llscrolllistctrl.h. Definition at line 544 of file llscrolllistctrl.h. Definition at line 511 of file llscrolllistctrl.cpp. Definition at line 436 of file llscrolllistctrl.h. Definition at line 497 of file llscrolllistctrl.h. Definition at line 565 of file llscrolllistctrl.h. Definition at line 481 of file llscrolllistctrl.h. Definition at line 2373 of file llscrolllistctrl.cpp. References LLUICtrlFactory::getAttributeColor(), S32, setBackgroundVisible(), setBgSelectedColor(), setBgStripeColor(), setBgWriteableColor(), setColumnPadding(), setDrawStripes(), setFgDisableColor(), setFgSelectedColor(), setFgUnselectedColor(), setHighlightedColor(), and setReadOnlyBgColor(). Definition at line 2277 of file llscrolllistctrl.cpp. References LLScrollbar::getDocPos(), mScrollbar, onScrollChange(), and LLScrollbar::setDocPos(). Referenced by LLFloaterInspect::refresh(), LLFloaterAvatarList::refreshAvatarList(), LLPanelFriends::refreshNames(), reshape(), scrollToShowSelected(), LLFloaterNewIM::setScrollPos(), and LLFloaterEventLog::updateList(). Definition at line 505 of file llscrolllistctrl.h. Definition at line 1410 of file llscrolllistctrl.cpp. References LLSD::asString(), commitIfChanged(), deselectAllItems(), deselectItem(), FALSE, mAllowMultipleSelection, mCommitOnSelectionChange, mItemList, selectItem(), and TRUE. Definition at line 437 of file llscrolllistctrl.h. Definition at line 2207 of file llscrolllistctrl.cpp. Referenced by addItem(), and sortByColumn(). Definition at line 566 of file llscrolllistctrl.h. Definition at line 3012 of file llscrolllistctrl.cpp. References addElement(), LLSD::beginArray(), and LLSD::endArray(). This function allows to avoid multiple unnecessary sorts in the case where multiple elements will be added or removed at once. Definition at line 2251 of file llscrolllistctrl.cpp. References mItemList, mSortAscending, and mSortColumn. 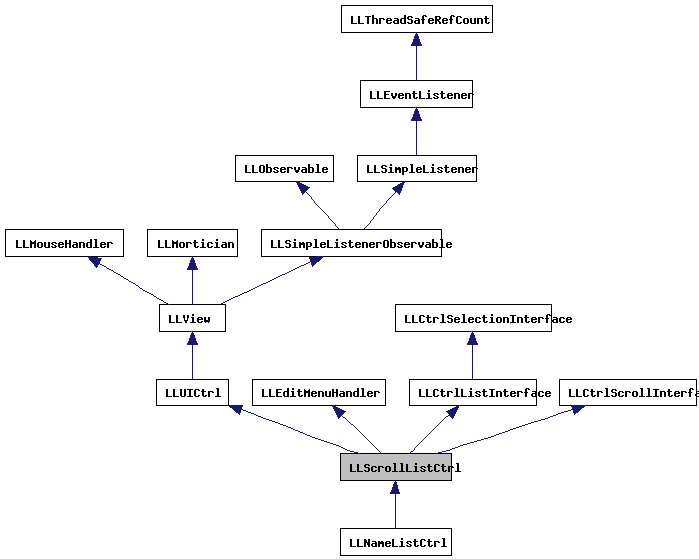 Referenced by LLFloaterAvatarList::refreshAvatarList(), and LLFloaterEventLog::updateList(). Definition at line 2256 of file llscrolllistctrl.cpp. References mColumns, mSortAscending, mSortColumn, and sortByColumn(). Definition at line 2227 of file llscrolllistctrl.cpp. References mItemList, mSortAscending, mSortColumn, mSorted, setSorted(), and TRUE. Referenced by LLColumnHeader::draw(), LLFloaterAvatarList::LLFloaterAvatarList(), LLFloaterEventLog::LLFloaterEventLog(), onClickColumn(), LLColumnHeader::onSelectSort(), LLDispatchSetEstateAccess::operator()(), LLPanelDirLand::postBuild(), LLPanelLandBan::postBuild(), LLPanelLandAccess::postBuild(), LLPanelAvatar::processAvatarGroupsReply(), LLPanelActiveSpeakers::refreshSpeakers(), LLPanelAvatar::resetGroupList(), LLColumnHeader::showList(), LLPanelLandObjects::sortBtnCore(), sortByColumn(), LLComboBox::sortByName(), and LLPanelGroupRolesSubTab::update(). Definition at line 986 of file llscrolllistctrl.cpp. Definition at line 999 of file llscrolllistctrl.cpp. Definition at line 799 of file llscrolllistctrl.cpp. References LLRectBase< Type >::getHeight(), LLView::getRect(), LLView::getVisible(), LLRectBase< Type >::getWidth(), i, left, llmax(), llmin(), llround(), LLRectBase< Type >::mBottom, mColumnPadding, mColumns, mColumnsIndexed, mDisplayColumnHeaders, LLScrollListColumn::mHeader, mHeadingHeight, LLScrollListColumn::mIndex, mItemList, mItemListRect, LLRectBase< Type >::mLeft, mNumDynamicWidthColumns, mScrollbar, LLRectBase< Type >::mTop, mTotalStaticColumnWidth, LLScrollListColumn::mWidth, NULL, LLView::reshape(), right, S32, LLView::setVisible(), top, and LLView::translate(). Referenced by addColumn(), addItem(), reshape(), setDisplayHeading(), and LLColumnHeader::userSetShape(). Definition at line 781 of file llscrolllistctrl.cpp. References i, llmax(), mItemList, mLineHeight, and S32. Definition at line 746 of file llscrolllistctrl.cpp. References LLScrollListItem::getColumn(), LLScrollListCell::getText(), LLFontGL::getWidth(), llmax(), mColumnPadding, mColumns, mItemList, S32, and LLFontGL::sSansSerifSmall. Referenced by LLNameListCtrl::addElement(), addItem(), clearRows(), deleteSelectedItems(), deleteSingleItem(), and LLNameListCtrl::refresh(). Definition at line 612 of file llscrolllistctrl.h. Referenced by handleKeyHere(), and setAllowKeyboardMovement(). Definition at line 611 of file llscrolllistctrl.h. Referenced by canSelectAll(), getXML(), isDirty(), selectItemAt(), setAllowMultipleSelection(), and setSelectedByValue(). Definition at line 633 of file llscrolllistctrl.h. Referenced by draw(), getXML(), and setBackgroundVisible(). Definition at line 637 of file llscrolllistctrl.h. Referenced by draw(), getXML(), and setReadOnlyBgColor(). Definition at line 638 of file llscrolllistctrl.h. Referenced by drawItems(), getXML(), and setBgSelectedColor(). Definition at line 639 of file llscrolllistctrl.h. Referenced by drawItems(), getXML(), and setBgStripeColor(). Definition at line 636 of file llscrolllistctrl.h. Referenced by draw(), getXML(), and setBgWriteableColor(). Definition at line 651 of file llscrolllistctrl.h. Referenced by draw(), and getXML(). Definition at line 645 of file llscrolllistctrl.h. Referenced by reshape(), and selectItemAt(). Definition at line 617 of file llscrolllistctrl.h. Referenced by drawItems(), getCanSelect(), handleDoubleClick(), handleHover(), handleKeyHere(), selectItemAt(), setCanSelect(), and setEnabled(). Definition at line 619 of file llscrolllistctrl.h. Definition at line 631 of file llscrolllistctrl.h. Referenced by addColumn(), drawItems(), getColumnPadding(), getXML(), setColumnPadding(), updateColumns(), and updateMaxContentWidth(). Definition at line 666 of file llscrolllistctrl.h. Referenced by addColumn(), addElement(), clearColumns(), getXML(), onClickColumn(), setColumnHeadings(), setColumnLabel(), sortByColumn(), updateColumns(), and updateMaxContentWidth(). Definition at line 667 of file llscrolllistctrl.h. Referenced by addColumn(), addElement(), drawItems(), getColumn(), getNumColumns(), getSortColumnName(), onClickColumn(), and updateColumns(). Definition at line 613 of file llscrolllistctrl.h. Referenced by handleKeyHere(), handleUnicodeCharHere(), selectNextItem(), selectPrevItem(), and setCommitOnKeyboardMovement(). Definition at line 614 of file llscrolllistctrl.h. Referenced by deselectAllItems(), handleKeyHere(), handleUnicodeCharHere(), selectAll(), selectFirstItem(), selectItemAt(), selectMultiple(), selectNthItem(), selectPrevItem(), selectSimpleItem(), selectSimpleItemByPrefix(), setCommitOnSelectionChange(), and setSelectedByValue(). Definition at line 602 of file llscrolllistctrl.h. Definition at line 603 of file llscrolllistctrl.h. Definition at line 656 of file llscrolllistctrl.h. Referenced by addColumn(), and addElement(). Definition at line 669 of file llscrolllistctrl.h. Referenced by clearRows(), commitIfChanged(), handleMouseUp(), isDirty(), and resetDirty(). Definition at line 618 of file llscrolllistctrl.h. Referenced by addColumn(), getXML(), reshape(), setDisplayHeading(), setHeadingHeight(), and updateColumns(). Definition at line 634 of file llscrolllistctrl.h. Referenced by drawItems(), getXML(), and setDrawStripes(). Definition at line 674 of file llscrolllistctrl.h. Definition at line 642 of file llscrolllistctrl.h. Referenced by drawItems(), getXML(), and setFgDisableColor(). Definition at line 640 of file llscrolllistctrl.h. Referenced by drawItems(), getXML(), and setFgSelectedColor(). Definition at line 641 of file llscrolllistctrl.h. Referenced by drawItems(), getXML(), and setFgUnselectedColor(). Definition at line 608 of file llscrolllistctrl.h. Referenced by addColumn(), reshape(), setDisplayHeading(), setHeadingHeight(), and updateColumns(). Definition at line 643 of file llscrolllistctrl.h. Referenced by drawItems(), getXML(), and setHighlightedColor(). Definition at line 650 of file llscrolllistctrl.h. Referenced by drawItems(), and highlightNthItem(). Definition at line 620 of file llscrolllistctrl.h. Referenced by onFocusLost(), and setIsPopup(). Definition at line 623 of file llscrolllistctrl.h. Referenced by addItem(), canSelectAll(), clearRows(), deleteSelectedItems(), deleteSingleItem(), deselectAllItems(), drawItems(), getAllData(), getAllSelected(), getFirstData(), getFirstSelected(), getFirstSelectedIndex(), getItemCount(), getItemIndex(), getLastData(), getSelectedIDs(), handleUnicodeCharHere(), hitItem(), isEmpty(), isSelected(), LLNameListCtrl::refresh(), scrollToShowSelected(), selectAll(), selectFirstItem(), selectItemAt(), selectMultiple(), selectNextItem(), selectNthItem(), selectPrevItem(), selectSimpleItem(), selectSimpleItemByPrefix(), setSelectedByValue(), sort(), sortByColumn(), swapWithNext(), swapWithPrevious(), updateColumns(), updateLineHeight(), updateMaxContentWidth(), and ~LLScrollListCtrl(). Definition at line 629 of file llscrolllistctrl.h. Referenced by addColumn(), addItem(), drawItems(), getItemListRect(), handleMouseUp(), hitItem(), reshape(), setHeadingHeight(), and updateColumns(). Definition at line 625 of file llscrolllistctrl.h. Referenced by clearRows(), deleteSelectedItems(), deleteSingleItem(), deselectItem(), getLastSelectedItem(), selectItem(), and selectItemAt(). Definition at line 605 of file llscrolllistctrl.h. Referenced by addItem(), arrange(), drawItems(), getRequiredRect(), hitItem(), reshape(), and updateLineHeight(). Definition at line 627 of file llscrolllistctrl.h. Referenced by addItem(), addSimpleItem(), addStringUUIDItem(), and setMaxItemCount(). Definition at line 609 of file llscrolllistctrl.h. Referenced by canSelectAll(), getMaxSelectable(), selectItemAt(), and setMaxSelectable(). Definition at line 616 of file llscrolllistctrl.h. Referenced by draw(), handleHover(), handleKeyHere(), handleMouseDown(), handleMouseUp(), and handleUnicodeCharHere(). Definition at line 659 of file llscrolllistctrl.h. Referenced by addColumn(), drawItems(), setNumDynamicColumns(), and updateColumns(). Referenced by handleDoubleClick(), and setDoubleClickCallback(). Referenced by selectItemAt(), and setMaxiumumSelectCallback(). Referenced by onClickColumn(), and setSortChangedCallback(). Definition at line 670 of file llscrolllistctrl.h. Referenced by isDirty(), resetDirty(), selectFirstItem(), and selectNthItem(). Definition at line 607 of file llscrolllistctrl.h. Referenced by addItem(), drawItems(), hitItem(), reshape(), and scrollToShowSelected(). Definition at line 610 of file llscrolllistctrl.h. Referenced by addColumn(), addItem(), clearRows(), drawItems(), getScrollPos(), handleKeyHere(), handleScrollWheel(), reshape(), setEnabled(), setHeadingHeight(), setScrollPos(), and updateColumns(). Definition at line 606 of file llscrolllistctrl.h. Referenced by clearRows(), drawItems(), hitItem(), and scrollToShowSelected(). Definition at line 658 of file llscrolllistctrl.h. Referenced by deselectItem(), getSearchColumn(), handleKeyHere(), handleUnicodeCharHere(), selectItem(), selectSimpleItemByPrefix(), and setSearchColumn(). Definition at line 653 of file llscrolllistctrl.h. Referenced by clearSearchString(), handleKeyHere(), handleUnicodeCharHere(), selectItemAt(), selectNextItem(), selectNthItem(), selectPrevItem(), and setFocus(). Definition at line 654 of file llscrolllistctrl.h. Referenced by drawItems(), handleKeyHere(), and handleUnicodeCharHere(). Definition at line 615 of file llscrolllistctrl.h. Referenced by commitIfChanged(), deselectItem(), handleMouseDown(), handleMouseUp(), onFocusReceived(), selectItem(), and selectItemAt(). Definition at line 663 of file llscrolllistctrl.h. Referenced by addItem(), getSortAscending(), onClickColumn(), sort(), and sortByColumn(). Definition at line 662 of file llscrolllistctrl.h. Referenced by addItem(), getSortColumnName(), onClickColumn(), sort(), and sortByColumn(). Definition at line 664 of file llscrolllistctrl.h. Referenced by isSorted(), setSorted(), and sortByColumn(). Definition at line 660 of file llscrolllistctrl.h. Referenced by addColumn(), drawItems(), setTotalStaticColumnWidth(), and updateColumns().